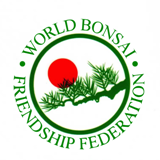 This is the single most important factor in the care of bonsai. 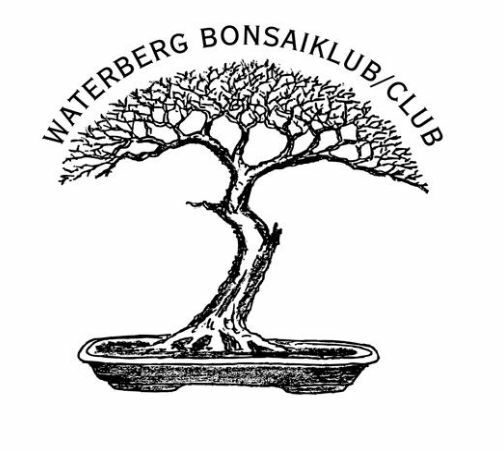 Most bonsai die from a lack of water. A few die from too much of water. Too much water retention is linked to the soil medium structure. Your watering technique should be, pouring water slowly near the base of the tree until the excess water flows out the bottom of the container. As a general rule, in spring and autumn water every third day. In summer water every 2nd day to and in winter water every third day. The amount of water that your bonsai needs, is dependant on 5 factors. 1. The depth and volume of soil. Your bonsai is growing in a limited shallow amount of soil with a drainage hole. A pot of 6cm in height will dry out 4 times slower than a 3 cm pot and not double as one would expect. 2. The colour of your pot. The bonsai in a dark pot will heat up faster and cause more evaporation, as opposed to a light pot, which will have less heat retention and evaporation. 3. The ambient temperature and exposure to the elements of wind, heat and humidity. The tree transpires and combined with the effects evaporation through heat and wind, will rapidly dry out the soil. You must ensure that your bonsai soil is not allowed to dry out for more than 2 days without your knowledge. 4. They do not mind plenty of water, however they can dry out and tolerate extreme dryness in their natural climate. Lack of water makes the leaves droop, and may even shed their leaves and in extreme cases loose a branch. :) Hint: Place a wooden toothpick or chopstick in the soil for 5 minutes to establish the moisture content of the soil. If the toothpick is dry, water the bonsai. If the toothpick is wet, there is enough water within the soil. 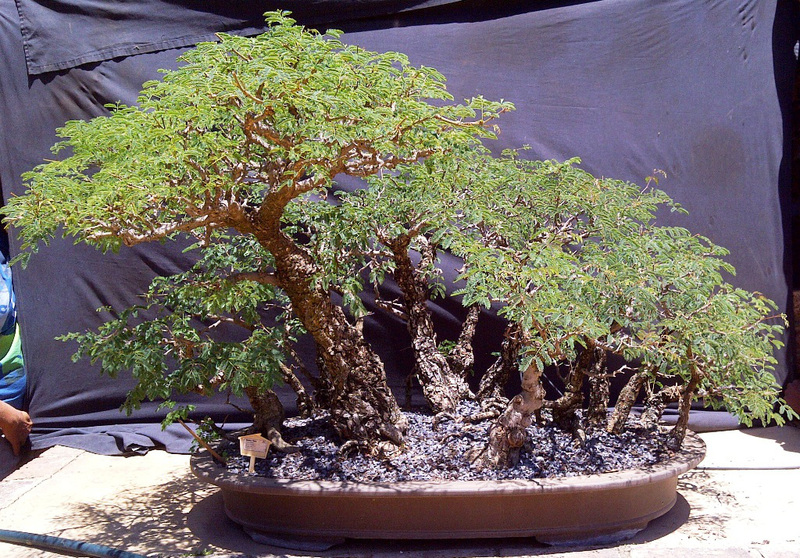 Senegalia is the renamed Botanical name for the commonly known Acacia. These trees are common in Zimbabwe, Northern and Western province, Mpumalangha and Natal where they grow in open grasslands. Monkey Thorns are large trees, averaging twenty meters in height. The wood is very hard. Being a tree, genetically, it grows best outdoors. The best location is in the garden under the shade of a tree or a shaded patio where it will receive the sunlight and not direct extended periods of the harsh afternoon sunshine. Thorn trees prefer full sun, about 4 hours morning sun, a day. More than this will cause drying out, which leads to other problems. The Black Monkey Thorn may be adapted to stay indoors in a well-lit and airy room. They can only be brought into the home for a week or so at a time - for display purpose - before being returned to their permanent home. Leaving it indoors for longer, will starve it of their natural growing light, and slowly starving it, with possible dire consequences. It is always advisable to place the Acacia bonsai where they cannot hook on the clothing or skin of traffic passing close by. Your Thorns should be continously while in leaf. If using liquid fertilisers, dilute the dosage by 50% of the recommended dosage and then double your feeding routine. This is done due to the limited amount of soil in the container. Your routine should be weakly, weekly! We prefer the organic brands. We recommend organic pellets because as one waters the nutrients are slowly release over a longer period of time. 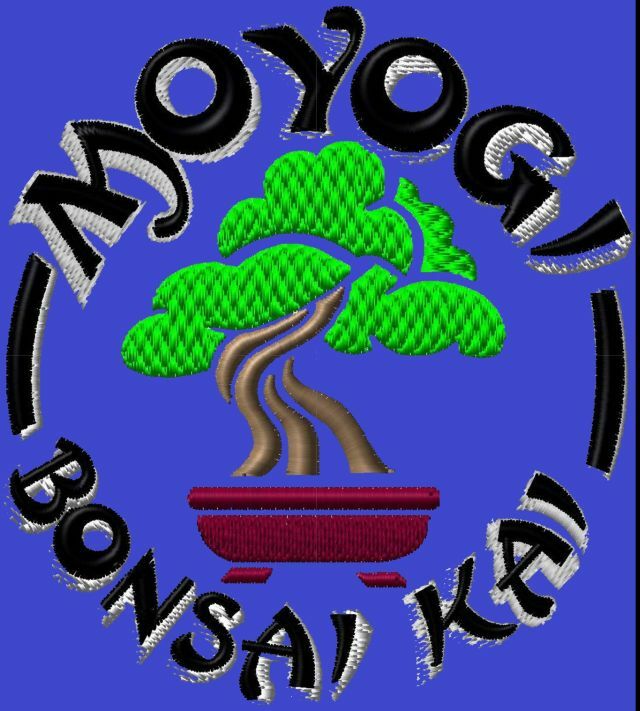 To maintain the shape, balance and harmony of your bonsai, you are required to constantly trim off unwanted growth. This can be similarly viewed as humans needing to remove unwanted hair. In bonsai this entails the removal - pinching or cutting off - of excess shoots and leaves. Elongated branches can be cut down to 30% or the first growing leaf or bud from the trunk. Pruning will encourage new side growth, with branch movement and character, the characteristics of a good bonsai. The sharpness of the thorns make the wiring of branches a delicate and slow process. They not only prick, scratch and tear the skin of hands and fore-arms but also hook in the sleeves of clothing. The new branch starts inbetween the two hook thorns. Cutting too close to the thorn creates a knuckle. So it is advisable to leave a space between the two internodes to allow die back. 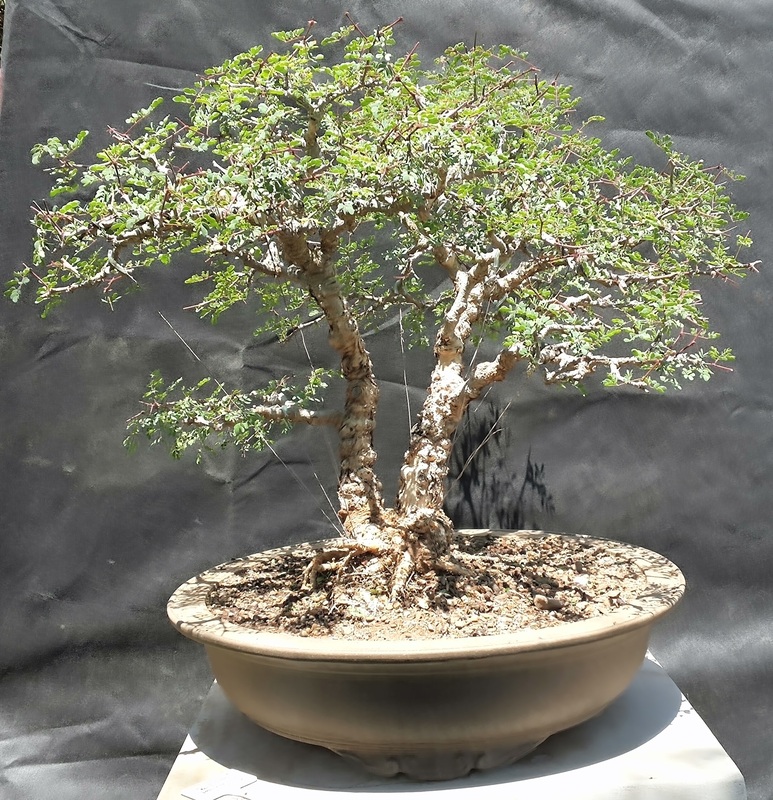 To understand the desired you will need to get to understand the various styles in bonsai and also the tendencies of shape that your species grows in the wild. Due to the limited amount of soil, the tree may become pot bound within 5 years and the nutrients depleted. The nutrients in the soil need to be replaced, or your bonsai will deteriorate. In spring, as the buds start to show and swell, gently remove the bonsai from its container. Uncoil the roots by raking out the roots. You may find that the thorn trees have a very long tap root. Removing this tap root can kill the tree. You need to ensure that there are other feeder roots, that can take over from the tap root. Remove about 10-20% of outer soil and roots. Cut off all dangling roots. Replace the bonsai and fill in the gaps with fresh bonsai soil mix. Dunk the container in a bowl of water to expel all trapped air. Ensure that the new soil is now pressed firmly around the pot and tree. Place in a shady spot until new growth emerges. The bark of young Bonsai is cream-coloured and papery at first . Consecutive layers later produce a rough, corky structure that finally changes colour to brown and black. The layers curl and crack longitudinally when forced outward by diagonal trunk expansion. The rough bark soon gives an ancient appearance to the trunk of galpinii bonsai. The outermost layers do flake off after a while. The thorns average one centimeter in length and are hooked. They stand in pairs just below the nodes. Inbetween the two thorns, the new buds will appear. Mature trees produce cream-coloured flowers in early spring on their terminal buds. In bonsai, these terminal buds are pruned off, so it is very rare that these thorn trees are seen as flowering bonsai. The leaves are "feather-like" because each one consists of a great number of small and delicate leaflets which stand in two rows, one on each side of a midrib. They have a problem of often forming reverse taper at their bases.